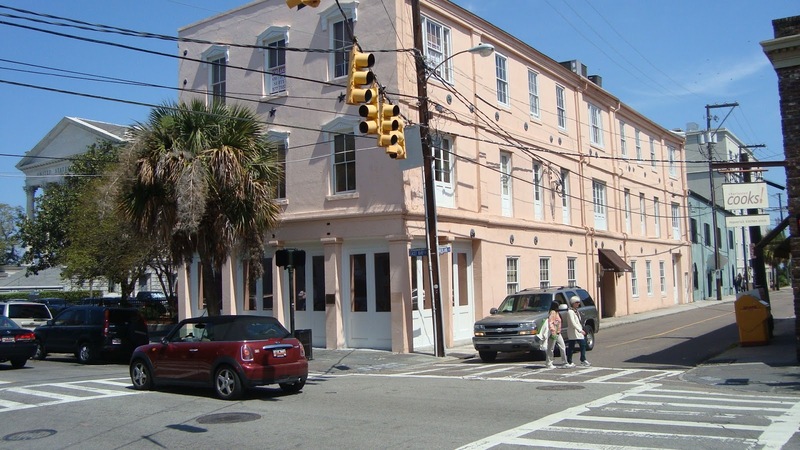 Heroes, Heroines, and History: Charleston on Shaky Ground plus GIVEAWAY! 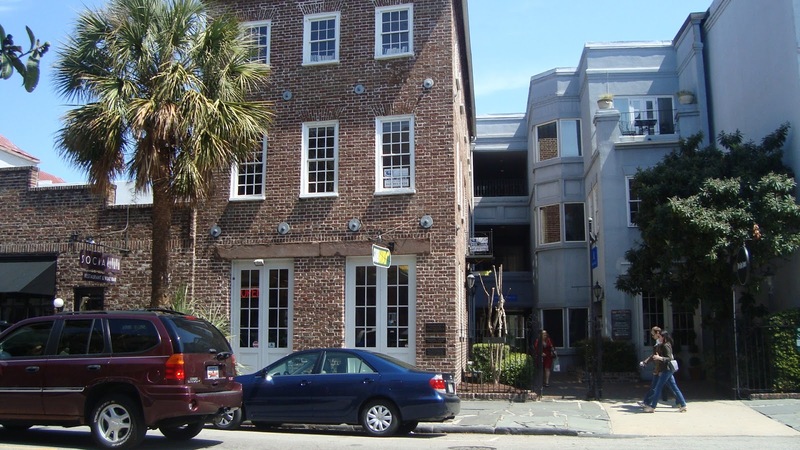 Charleston on Shaky Ground plus GIVEAWAY! One of my favorite places to visit is Charleston, SC. I love to walk down the old brick streets and admire the the Antebellum homes. One thing always stands out as I walk down the streets and that's the earthquake bolts they used to secure damaged buildings. 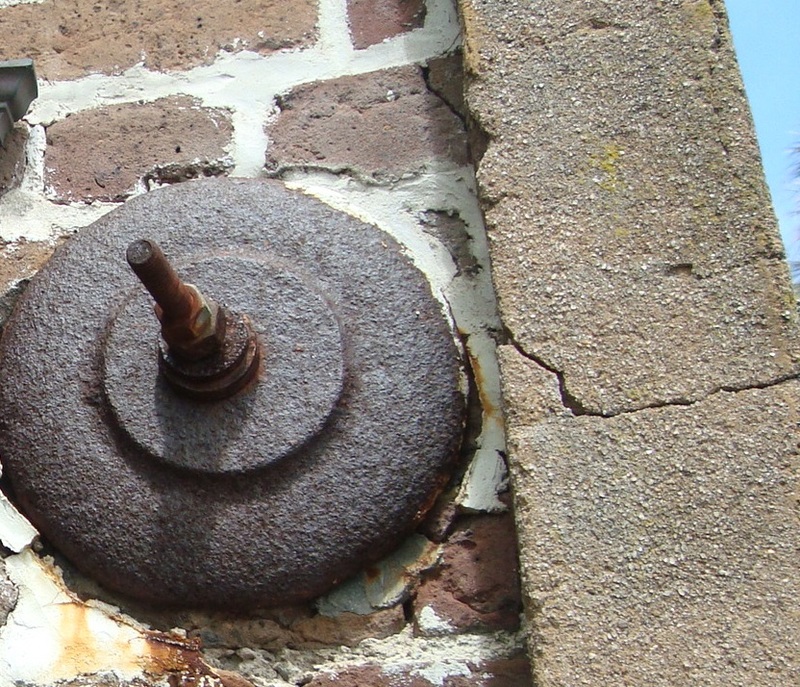 Picture of an earthquake bolt I took on one of Charleston's buildings. 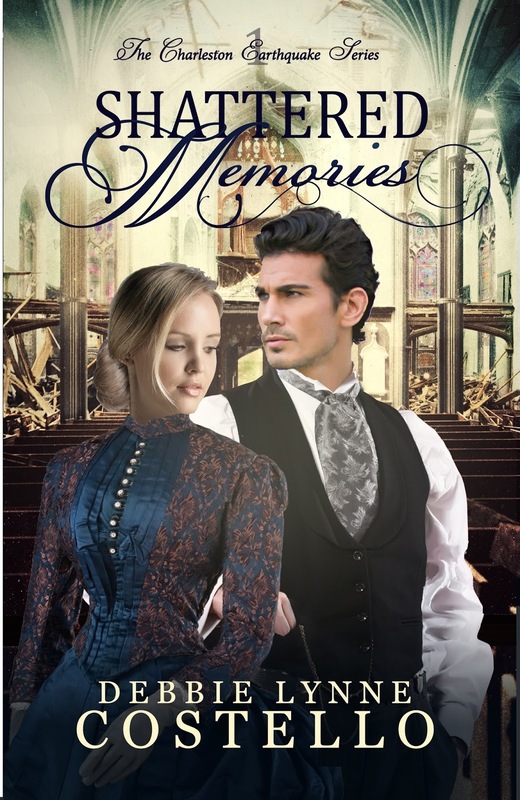 My upcoming release, Shattered Memories is centered around the 1886 Charleston earthquake. Charleston, SC is not known for its seismic activity, but on August 31st at 9:50 pm a quake hit the city that shook it to its core. 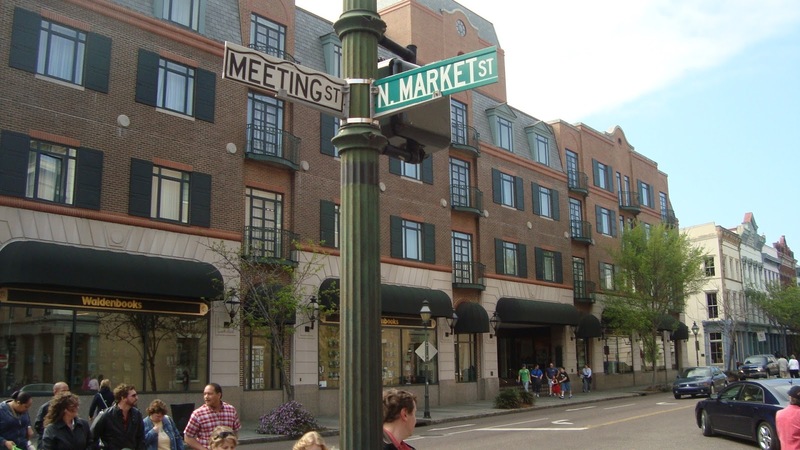 An earthquake that registered 7.0 in magnitude rocked Charleston and the surrounding areas. 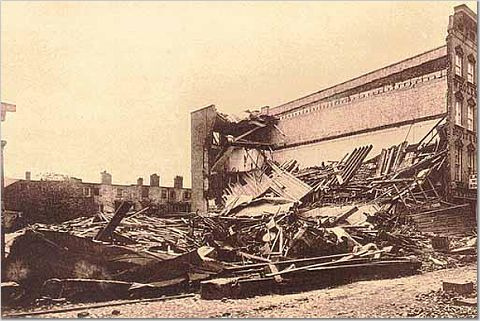 Buildings crumbled and fell into the streets, leaving some streets impassible. The devastation was immeasurable. 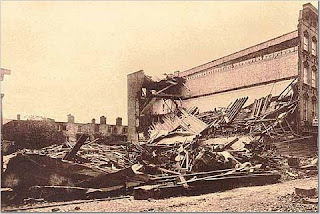 Very few buildings escaped damage or complete destruction. The buildings that were were salvageable were repaired using long rods for reinforcement. The rods were run through the walls then secured with a washer (known as a gib plate) and a iron nut. The earthquake bolts weren't something many of the affluent home owners wanted adorning the their homes. To disguise the bolt ends, cast iron decorations from stars to lion heads were made to cover the ends and adorn the buildings. Right before the quake struck witness told of a roaring sound like that of a train that barreled toward them. The ground shook and people ran from their homes and into the streets and parks. Some over-zealous men preached in the parks and streets warning that God's wrath was upon them and demanded repentance as wave after wave of quakes rolled through. Gas lines and water lines were broke from the twisting of the earth. 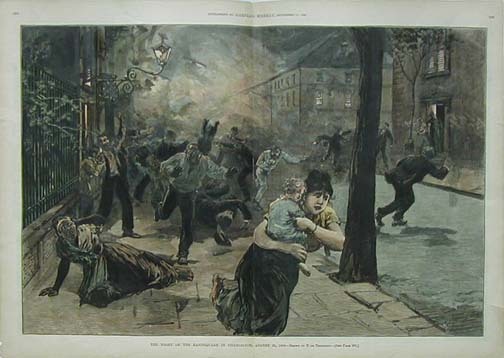 Fires broke out and spread quickly through the damaged buildings and the broken waterlines made fighting the fires a lost cause. 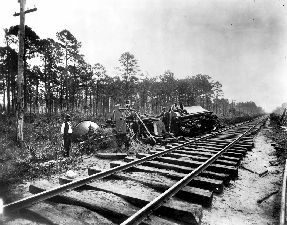 Wires were cut and railroad tracks were twisted and torn apart separating Charleston from the outside world. As people gathered in the city squares, many of them sang songs to bring calm to the crowds. When the initial quake was over the homes weren't safe to sleep in so they slept in the parks. As the days went by and the aftershocks continued word got out to the rest of the world. 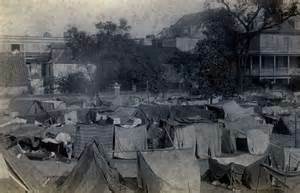 Tents were sent in for the homeless Charlestonians. Over 300 aftershocks would hit Charleston over the next 3 years. The toll that the earthquake took didn't stop with the buildings. Over 60 people died and the health of many people were affected by the quakes. Today we know some of those aliments as PTSD. People suffered from nausea, headaches, one woman lost her hair, some went crazy. There were even reports where three woman were frightened to death. Charleston is a resilient city. They proved that with the rebuidling of the city after the Civil War. They rebuilt their city after the earthquake in just a few short years. Many had to rebuild their lives as well. 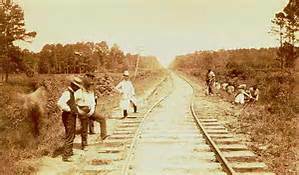 But Charleston would never be the same, it would always carry the scares of August 31st, 1886. Those scars are cold earthquake bolts. You can see them in the picture I took below. It is thought that earthquake was a 7.6 in magnitude. An estimated 14,000 chimneys fell from the quake. Almost every building was severally damaged. What information above did you find the most surprising? Why would you like to read Shattered Memories? To celebrate my new release, I'm giving away your choice of a signed copy of Shattered Memories or my debut Sword of Forgiveness. Be sure to answer one of the questions above and leave your email address to be entered. For extra entries share this post on FB and/or Twitter and let me know you shared. Giveaway ends February 10th. Olivia Macqueen wakes in a makeshift hospital, recovering from a head injury. With amnesia stealing a year of her memories, she has trouble discerning between lies and truth. When her memories start returning in bits and pieces, she must keep up the charade of amnesia until she can find out the truth behind the embezzlement of her family’s business while evading the danger lurking around her. Doctor Drew Warwick frantically searches through the rubble left by the Charleston earthquake for the lady who owns his heart. He finds her injured and lifeless. When she regains consciousness, the doctor’s hopes are dashed as he realizes she doesn’t remember him. But things only get worse after he discovers she believes she’s still engaged to the abusive scoundrel, Lloyd Pratt. Now Drew is on a race with the wedding clock to either help her remember or win her heart again before she marries the wrong man. I have actually been in an earthquake and that is saying a lot from a gal in Texas. My family and I were actually visiting California a number of years ago. We were sleeping in our motel room in San Francisco one night and all of a sudden a tremendous shaking started happening. If the headboards of the beds hadn't been bolted to the walls, our beds would have danced all over the room. I quickly looked out the window thinking it must be some kind of storm outside but everything was still as a mouse. On the news in a few hours, the earthquake was reported. Yes knew this about Charleston and that there is fault line through the mountains down to the coast sonce i went to school there....we have had small quakes here up by the smokies. Felt larger one when living in western NC. Largest was after shock felt while visiting San Francisco that woke me up from dead sleep and definitely sounded like loud train and the smaller shocks during the day while I was at my conference seeing the chandeliers move in first floor conference rooms at hotel. Very interesting article. Thank you. Thank you, Dawn. I just can't imagine being woke up from a deep sleep to find my bed shaking. Thank the Lord our buildings today are made to withstand earthquakes. Thanks for coming by!! Great post! I've lived in San Francisco a few years, and had my share of earthquakes, but never that that magnitude. When I visited Charleston a couple of years ago, I had made comments on the rods and adornment. As a designer, I knew the rods had more function for securing the structural elements, but I didn't know about the design aspect of why stars and lions. I also find surprising was some of the pictures you've shown. An earthquake of that magnitude can cause a lot of damage. I'm thinking of the Taiwan earthquake two days ago and the amount of lives lost and devastation is high. 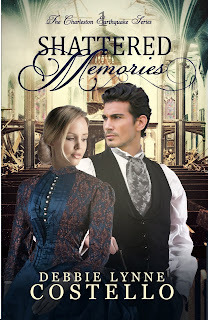 I would love to read Shattered Memories since I've already added to my TBR list. LOL. There's also the lost memories aspect I find intriguing. I shared on FB Group: Christian Books Giveaway & Deals, and on Twitter and Google+. Thank you, Annie! I'm so glad its on your TBR pile and thank you for sharing. Charleston has so much rich history. Even the buildings with their unusual nuts and bolts. I hadn't heard about the earthquake in Taiwan as I haven't seen the news. So sad to see that kind of loss of life. While in Nicaragua, I sitting down and all of a sudden saw and felt the floor move hard. Thought I was imagining it. My husband was an hour away at the airport, waiting for our team to fly in. Said things were moving, the plane couldn't land. Yikes! OH my goodness. I have wondered about that with planes. I guess they wouldn't know if the ground was going to open up so it wouldn't be safe to land a plane. I've never been in an earthquake, nor do I want to! Being in WI, the most we get are tornadoes, but I've manage to avoid those as well. So far..... Thanks for the giveaway!!! Hey Kate! Thanks for coming by. I've managed to miss any earthquake too. About 2 or 3 years ago I did feel an earthquake that had happened up in the north-east. I was in my dining room writing and I felt the floor shake and my china started jingling. But it was over about as quick as it started. Next thing I know my son who was in the Navy calls me from MD and says, "Did you feel that earthquake?" I couldn't believe we'd both felt the same quake! As I was beginning to hit "delete" from this post, I was drawn in to it. (and didn't delete it until I had read/reread every word) I am in NC, and didn't know this piece of history about Charleston. I visited the area with my late husband years ago. This isn't my usual genre, but I know I'd love this book. Great post! I have experienced an earthquake while we lived just outside of Palm Springs, CA. It was not an experience I would care to repeat! It was a small quake and didn't cause any damage except our frayed nerves...lol. This story is fantastic - I would love to wind print copy. I don't want to live through an earthquake either, Betti. Not after reading about Charlestons. 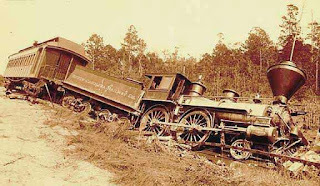 A very traumatic event. I'm so glad that there was no damage or loss of lives in the one you went through. God is good! I didn't know about the earthquake bolts and rods. That is pretty interesting. I can see why some of the home owners put more ornamental covers over them. Thanks for the information and the giveaway! I've shared this giveaway on Twitter, Facebook and Pinterest. 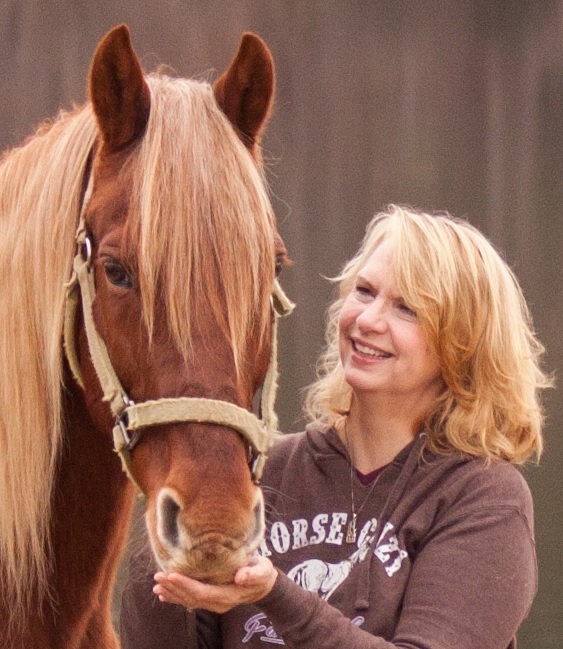 Awesome, Loraine! Thanks so much for sharing. I think if my house would have had to have them I would have put decorative bolts on mine if I could afford it. So much history every place we look, even in the most unusual places. I've experienced one earthquake in my life. They just don't happen very often in my area. That same earthquake was the first my grandmother experienced and she was almost 100 years old!! 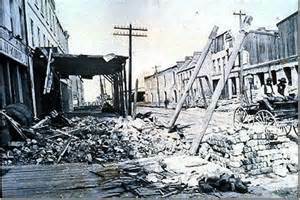 I did not know the Charleston earthquake was that destructive and I have never heard of earthquake bolts. How interesting! Debbie Lynne, the cover is gorgeous!!! Great article. Yes, I have been in numerous earthquakes. I lived in California for a while and we had them there. The scariest one, though, was the one I was in out at Colonial Williamsburg with my son, having lunch inside an old colonial building and i fear things might start coming down on us so we got outside and stayed there. We're not used to those here! Hey Carrie! I didn't know you lived in California. When was the one in Williamsburg? Was that just a few years ago? I'm wondering if that is the one that we felt in SC. I love my cover too. 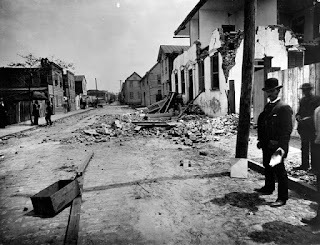 I think what makes me love it so much is knowing that the background picture is a real 1886 picture of some of the destruction Charleston received. Robert and I visited Charleston about seven years ago when I was researching the area for a book series. I was amazed at all the history in the area. I come from OK--a state that is only 109 years old. There are no buildings that are older than about 110 years. It blew my mind to see homes and buildings that were 300-400 years old. It's sad to think that some of them were destroyed in the earthquake. And yes, I have been in an earthquake. We've had a bunch in OK the past few years, but fortunately, I only endured one of them. I love Charleston's history. It's everywhere you look. I didn't realize OK was so young! I bet that was a shock! I also didn't know OK had earthquakes. It seems few states are immune from them. Thanks for this very interesting post. In the early 1980s there was an earthquake in our area. It was a Sunday afternoon and we were about 15 miles from our home. We felt the tremors and when we returned home, there was structural damage to our basement. Ours was minor compared to what you described but it is an eerie feeling when the ground shakes under your feet! Debbie, I shared on Twitter. Hey Connie. thank you for sharing on twitter! Wow that had to be a shock to come home and find your basement damaged. The small tremor I felt I was sitting down. I can't imagine standing and feeling the earth move below my feet. Maybe something like being on a boat in an angry sea. Hi Debbie Lynne, Thank you for this interesting post. I have to admit I was surprised to learn that Charleston had earthquakes much less such a devastating one. Never having been in an earthquake I can only imagine what it must have been like for those people at that time. That's one of the reasons I would like to read your book Shattered Memories,plus it looks like a very good story! My e-mail is lynnefeuerstein(at)aol(dot)com,thanks for the giveaway. Thanks for coming by Lynne! Earthquakes aren't common in Charleston and that is probably why many people didn't know what was happening when it started. Such a scary thing. For the magnatude of the quake and the devastation I'm surprised more people didn't die. I suppose the time of the quake had a lot to do with that though. Good luck! Be sure to stop by my blog party for more chances to win. We'll be giving away gift baskets,kindles, gift cards, books, and so much more. Starts the 10th at www.theswordandspirit.blogspot.com. Hope to see you there! Hi Debbie. So excited you are coming out with another book. Why do I want to read it? Because I enjoyed your first one very much. I was in an earthquake while I was in elementary school in northeast Ohio. We do not get too many but that one did shake up a lot of people. Am I right to assume that you will have Shattered Memories in paperback? And if so, will it be released at the same time? Thanks looking forward to another one of your stories. I live in Oklahoma and we do have earthquakes. Hi Karen, Wow! I didn't know Oklahoma had earthquakes. Thanks for sharing. Thanks for posting great info. kamundsen44ATyahooDOTcom. Thanks for coming by, Kim. I live in the upstate of SC and love to visit Charleston! I wouldn't say that I have been in an earthquake, but a few years back while sitting at my desk chair I definitely felt an earthquake Later on we heard that the earthquake was centered up in Virginia. I would love to read your novel and learn more about Charleston! Hey Patty! That has to be the same one I felt. Closest I've ever been to an earthquake and as close as I want to be too! I did feel the tremors of an earthquake a couple of years ago. The earthquake was in Ohio and I live in East Tennessee. It was a very eerie feeling. I can't imagine how horrifying it would be to be in the midst of a strong one that did terrible damage. It isn't surprising to me that people suffered long-term effects mentally and emotionally. may_dayzee(at)yahoo(dot)com (Shared on my Pinterest Book Giveaway board). Amazing how far apart these earthquakes can be felt. They didn't know about PTSD back then but they knew that it affected people and changed some forever. I visited Charleston, SC when my son was there in the Naval Engineering program. I really enjoyed my visit. It was my first taste of boiled peanuts :-) Your book sounds like a very interesting read and I love the cover! Growing up in southern California I have witnessed my share of earthquakes. It is a very weird feeling to feel the ground start rolling and the rooms swaying. The closest thing I can compare it to is being on a ship with the undulating rolling ocean. Best of wishes on your new release! No need to enter me in the drawing. Thanks for stopping by and sharing Kathryn. That's actually how I imagined it being. You hear about people not getting their sea legs for many days. Have a great weekend! I was so happy to see your new release. Congrats and wishes for its success. Hey Terrill. I bet that was interesting seeing some of what the earthquake left behind. I've heard that Washington gets some small quakes. I have family that lives in WA. I'm with you on the "Big One". I don't think they know. Only God knows and it isn't going to happen a day before He wants it to if it even does no matter what people predict. Great photos, Debbie Lynne! And what a perfect backdrop for your story. Having read your book, don't enter me in the contest--but I can attest that it's wonderful and wish you the best of success with it! Thank you, Linore! You're sweet. I'm glad you enjoyed it. The winner is... Just Commonly--Annie! Congratulations! Annie please leave me your email address so I can contact you. Thanks! Thanks Debbie! I can't wait to read this!